The analysis of longitudinal data has quickly gained in importance across a variety of fields because it allows for the examination of questions about change over time. This is why all of our current workshops (Network Analysis, Latent Class/Mixture Modeling, Multilevel Modeling, Structural Equation Modeling, and Longitudinal Structural Equation Modeling) address the analysis of longitudinal data to some degree. A common theme underlying nearly any analysis of repeated measures data is the importance of modeling between-unit differences in within-unit change. We use the term “unit” instead of “person” because these models can be applied to repeated measures that have been drawn from any unit of observations, whether that is an individual person or region of the brain or even country. This latter application is clearly demonstrated in a recent article in the New York Times examining the relation between health expenditures and health outcomes over time and across country. 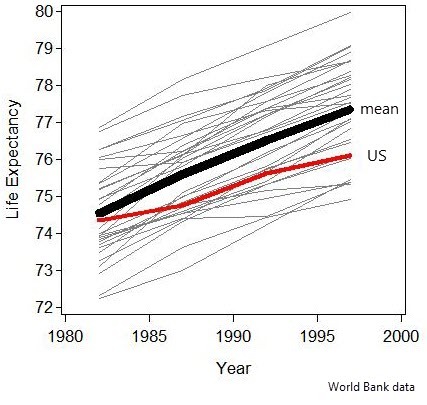 The article presents several highly impactful graphics that clearly show that the United States was characterized by a trajectory of life expectancy that was similar to a number of comparable countries, but only up to about 1980. After that time the US has systematically fallen behind comparison countries, even though health care spending has increased during this same period. Of course the identification of the specific causal influences leading to these changes is complex, but only through the analysis of the repeated measures data on both health care spending and life expectancy could these trends be identified. Developing an understanding of these trajectories in turn allows for the generation of hypotheses about the causal mechanisms and the implementation of changes in policy that might lead to improvements in life expectancy in the future. It is thus important to consider the analysis of individual trajectories, regardless of what “individual” means in your own research application.